Nowadays we see that many people are asking to be baptised and become members of the Church. They are disillusioned with other religions and theories, including atheism, and come to the Orthodox Church. 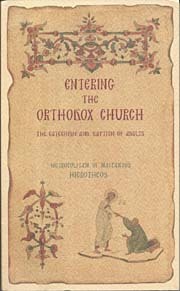 As we read ‘Entering the Orthodox Church” we realise that it makes a significant contribution to the pastoral care of those entering the Orthodox Church. In addition it is a useful aid for those already baptised, in other words, for every faithful member of the Church. The task of Catechism should be undertaken responsibly and seriously, not in a secular or indiscriminate manner, because it is a blessed ministry.